As of January, we have resumed our use of targeted savings accounts! I missed this system so in the last 2.5 years when our life has been in flux: becoming funemployed, living apart, moving to Seattle, and having a baby. But said baby is over six months old now and things are much more predictable, so we’re back to using targeted savings. But pressing “play” on our targeted savings system again is not like starting it up from scratch. When we first started up our targeted savings accounts, we were kinda broke. I mean, we had retirement savings, but we were living paycheck-to-paycheck in terms of our cash on hand. We had an anemic emergency fund and whatever we had been paid in the previous month to pay for both our regular and irregular expenses. And that sucked. So we started using targeted savings accounts to turn our irregular expenses into regular, fixed expenses. We set up relatively small monthly savings rates to our targeted savings accounts and pulled from them whenever we incurred an irregular expense. All that is the same this time around, except the expected expenses have changed. Here’s what’s different: When we started up our targeted savings accounts last time, we didn’t have any savings. They were built up completely by the monthly savings rates. This was quite difficult for about the first year because we still had to pay for irregular expenses as they came up, even though we hadn’t had sufficient time to build up the savings. This time around, we have some cash savings so we can pre-fill some of the targeted savings accounts. This means that our current system is a bit more varied than our last one. We still have the proactive system of saving on an ongoing basis for predictable future expenses. But in addition, we have various amounts of money set aside for expenses that might occur at any time. Once those expenses do occur, we will refill our targeted savings accounts up to their starting balances. This refill money will probably usually come from budget leftovers, but could also come from money saved in other targeted savings accounts if we come in under budget on some expenses. Here’s an example to illustrate both of these aspects of the accounts. Our “Cars” targeted savings account will cover regularly occurring expenses like biannual insurance, annual registration, and annual inspection. We know when these expenses will occur and in what approximate amounts, so we have a savings rate set up to fund them ($79.44/month). But in addition, we have $400 already sitting in the account, designated for repairs and maintenance, which could occur at any time. Once we do incur a repair/maintenance cost that draws down that $400, we will refill that amount with available cash flow, probably over a few months. There’s no big rush to get the account back up to $400 (plus the ongoing savings), though ideally it would be back at that level before we incur the next repair/maintenance cost. You can see the starting balances and savings rates in each of our targeted savings accounts in our budget report from January. This is a new type of system for us – both proactive and reactive saving – and it’s only possible because we had savings left over from last time we built up our targeted savings accounts. At that time, we just kept saving and never really considered when an account was “full” with respect to our spending needs over the coming year. Under this system, we know when we can stop saving into one account and divert money to another. There is a snag that we’re struggling with right now: The refill money relies on us having leftover money from our regular monthly budget. The $800/month that we’re already funneling into our targeted savings accounts is just about all the cash flow we can anticipate having, so there either isn’t much left over from our budget or sometimes we have a deficit (like in January). 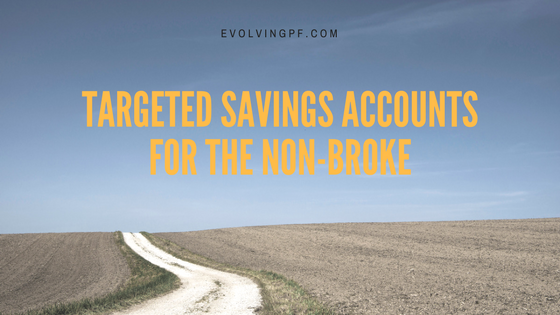 I can see in our projections that our necessary saving into the targeted savings accounts drops quite a bit in June, so at that point we can probably do more to refill the starting balances of the targeted savings accounts – that is, unless new expenses start popping up on the horizon! If we never seems able to refill what we’ve spent out of the starting balances, we’re going to have to make more serious cuts to our regular monthly budget. The other big change this time around is that we haven’t literally opened new savings accounts to house our targeted savings, but rather we are letting the balances stay together in our checking account. I have a separate spreadsheet that keeps track of the current balance of each targeted savings bucket. This is due to laziness only, and if it looks like the monthly spending part of our checking account is encroaching on the started savings part, I’ll separate everything out under different accounts. Has your system of targeted savings accounts evolved over its tenure? Do you keep pockets of savings available for spending at any time and then pay yourself back? 6 Responses to "Targeted Savings for the Non-Broke"
We’ve always just had one big slush fund in savings (and some taxable stocks as a secondary emergency account). Back when we were broke, I’d have a list of all our expenses for the semester/year. Now I have a spreadsheet where some of the expenses are a black box… I know what our average cc spending is, but I don’t know how much is insurance vs. fancy coffee. I have in the past looked at, for example, how much of each paycheck we’re spending on fixed vs. variable expenses and just how much we are paying for insurance each year, but since everything kind of evens out and stays pretty predictable I don’t actually need to know the minutia. That seems like a nice spot! You know how to examine the details when called for, but you don’t have to continually keep track of them. We have targeted savings, but contribute monthly to them. Since it is hard to estimate what is needed in them, after 12 months, we look at what we actually spent and readjust the monthly contributions. I know my husband and I want to take a more expensive vacation for our 5 year anniversary in 1.5 years, so we upped our vacation account contributions so we’ll have enough. But if our plans change and we’re up for something similar, we can cut back on that automatic savings. But in all honesty, since traveling is something we both value, we may just keep at that savings level so we can do more trips in the future. But then we have a pet-emergency fund too, that after a while, we can stop putting so much in unless we have another major emergency. Working in fundraising with limited budgets, I’m not a fan of general savings accounts for all expenses; I like having multiple accounts so there’s an accurate level of what is available for each category. While yes, you could take from one account to help with a super emergency, it’s nice to see that yes, you do have $2,500 in your vacation account on top of your $10,000 in your home repair fund, so you can go on vacation this year. This sounds similar to what we’re doing now except that I’m planning to continually adjust our savings rates instead of doing it once per year. But once per year would be easier! We just don’t have the cash flow to over-save at the moment. That’s what I like about targeted savings accounts, too! Now I have to look at a spreadsheet instead of Mint to see the different balances, though. Where do you stash your cash when you’re saving up for something? Targeted savings takes some work, but most of it is in the planning and estimating costs, so that sort of takes as much time as you’ll let it.